I have recently became one of Alex's friends in this vast world of the internet and starting reading his post that really had nothing to do with his book... just a real sense of his surroundings. His certain passion for writing and making his word known, and a perspective on life we all can appreciate. Only then to discover he was soon releasing his book, and thought to myself...I want to get this word out. What the inspiration for this book was? I was a kid when Star Wars came out and that movie really sparked my interest in science fiction. 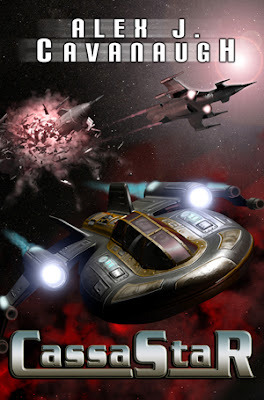 Specifically, the TV show Battlestar Galactica inspired the concept behind CassaStar. Yes, the original series was cheesy, but it planted the idea of fighter pilots firmly in my head. Who do you find to be your reading audience to be? My original audience was those who enjoyed a good science fiction adventure. However, once I began blogging, I realized CassaStar had a far wider audience than just science fiction fans. I think the strength of the characters will attract readers of other genres, both adults and teens. What do you want to say to the world about anything? Get off your cell phones while driving! Seriously though, I am excited and humbled by the interest in CassaStar and hope that all who read it enjoy the story! Thanks - that is so awesome!